Happy holidays from all of us at IAC! We'll be back on January 3. All of us at the Immunization Action Coalition (IAC) wish you, our readers, a safe, happy, and relaxing holiday season. Because of the holiday schedule, we will not publish another issue of IAC Express until January 3. The IAC office will be closed on December 25 and 26, as well as January 1. Every week throughout the year, IAC Express provides you with the critical immunization information you need in your work. Thus far in 2017, we have produced 60 issues with 850 articles that advance your immunization practice. Continuously since November 1997, we have published a total of 1,342 issues of IAC Express. 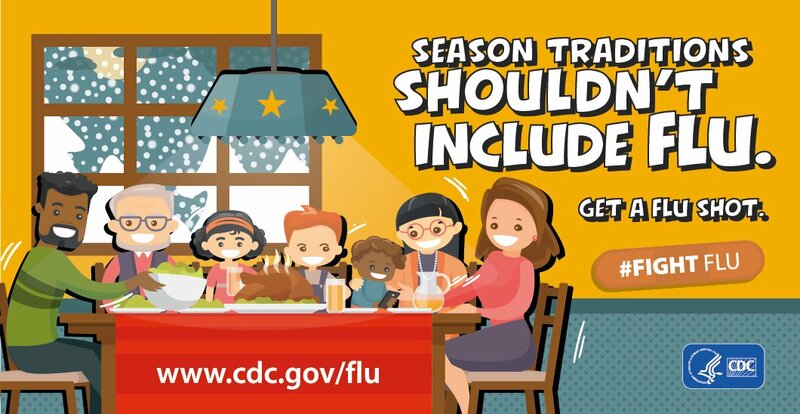 On December 13, The Lancet published a study by CDC and global partners that estimated more people worldwide die from seasonal influenza-related respiratory illnesses each year than previously thought. The first paragraphs from a related press release from CDC are reprinted below. According to new estimates published today, between 291,000 and 646,000 people worldwide die from seasonal influenza-related respiratory illnesses each year, higher than a previous estimate of 250,000 to 500,000 and based on a robust, multinational survey. The new estimate, from a collaborative study by CDC and global health partners, appears today in The Lancet. The estimate excludes deaths during pandemics. “These findings remind us of the seriousness of flu and that flu prevention should really be a global priority,” says Joe Bresee, MD, associate director for global health in CDC’s Influenza Division and a study co-author. Access the full CDC press release: Seasonal flu death estimate increases worldwide. Access the abstract from The Lancet: Estimates of global seasonal influenza-associated respiratory mortality: a modelling study. You must be a Lancet subscriber to access the entire article free of charge. Your nearest medical library may have it available for you. The CDC Childhood Immunization Champion Award is an annual award that recognizes individuals who make a significant contribution toward improving public health through their work in childhood immunization. Each year, up to one CDC Immunization Champion from each of the 50 U.S. states, eight U.S. territories and freely associated states, and the District of Columbia will be honored. Champions can include coalition members, parent advocates, healthcare professionals (e.g., physicians, nurses, physicians’ assistants, nurse practitioners, and medical assistants), and other immunization leaders who meet the award criteria. Self-nominations are welcome, or you may submit an application for a deserving individual. State immunization program managers, state and federal government employees of health agencies, individuals who have been affiliated with and/or employed by pharmaceutical companies, and those who have already received the award are not eligible to apply (for details, see page 3 of the nomination packet). Awardees will be announced during National Infant Immunization Week (NIIW), which runs April 21–28 in 2018. Champions will receive a certificate of recognition, will be featured on CDC’s web site, and may be recognized by their immunization program during NIIW. Nominations should be submitted to the immunization program manager in the state or territory where the nominee resides by February 2. Please contact your state immunization program to confirm your state’s deadline. Litjen (LJ) Tan, MS, PhD, IAC's chief strategy officer and co-chair and co-founder of the National Adult and Influenza Immunization Summit, has written a guest post on Every Child By Two's "Shot of Prevention" blog. Titled Flu Vaccine Benefits Go Beyond Effectiveness of One Strain, this column explores the recent speculation about the effectiveness influenza vaccination. Healthcare professionals will find much valuable information here to share with patients who are skeptical of the value of getting vaccinated against flu. Access Flu Vaccine Benefits Go Beyond Effectiveness of One Strain. On December 15, the The Daily Beast published an article by Dr. Paul Offit titled The Unhealthiest State in America Has the Best Vaccination Rate. The article describes the 1979 court case that led to Mississippi abolishing religious exemptions for vaccination and its current status as the nation's leader in childhood vaccination rates. The last two paragraphs are reprinted below. Dr. Paul A. Offit, MD, is director of the Vaccine Education Center at Children's Hospital of Philadelphia. The World Health Organization (WHO) published Review of global influenza activity, October 2016–October 2017 in the December 15 issue of its Weekly Epidemiological Record. The report summarizes the 2016–2017 influenza season in the temperate regions of the northern hemisphere, the 2017 influenza season in the temperate regions of the southern hemisphere, and influenza activity in tropical and subtropical regions. CDC published Introduction of Inactivated Poliovirus Vaccine and Elimination of Vaccine-Associated Paralytic Poliomyelitis—Beijing, China, 2014–2016 in the December 15 issue of MMWR (pages 1357–61). The first paragraph is reprinted below. When included in a sequential polio vaccination schedule, inactivated polio vaccine (IPV) reduces the risk for vaccine-associated paralytic poliomyelitis (VAPP), a rare adverse event associated with receipt of oral poliovirus vaccine (OPV). During January 2014, the World Health Organization (WHO) recommended introduction of at least 1 IPV dose into routine immunization schedules in OPV-using countries. The Polio Eradication and Endgame Strategic Plan 2013–2018 recommended completion of IPV introduction in 2015 and globally synchronized withdrawal of OPV type 2 in 2016. Introduction of 1 dose of IPV into Beijing’s Expanded Program on Immunization (EPI) on December 5, 2014 represented China’s first province-wide IPV introduction. Coverage with the first dose of polio vaccine was maintained from 96.2% to 96.9%, similar to coverage with the first dose of diphtheria and tetanus toxoids and pertussis vaccine (DTP) (96.5%–97.2%); the polio vaccine dropout rate (the percentage of children who received the first dose of polio vaccine but failed to complete the series) was 1.0% in 2015 and 0.4% in 2016. The use of 3 doses of private-sector IPV per child decreased from 18.1% in 2014, to 17.4% in 2015, and to 14.8% in 2016. No cases of VAPP were identified during 2014–2016. Successful introduction of IPV into the public sector EPI program was attributed to comprehensive planning, preparation, implementation, robust surveillance for adverse events after immunization (AEFI), and monitoring of vaccination coverage. This evaluation provided information that helped contribute to the expansion of IPV use in China and in other OPV-using countries. CDC published Large Outbreak of Neisseria meningitidis Serogroup C—Nigeria, December 2016–June 2017 in the December 15 issue of MMWR (pages 1352–6). A summary made available to the press is reprinted below. From December 2016–June 2017, Nigeria experienced the largest global outbreak of meningitis caused by a new strain of the bacteria N. meningitidis serogroup C (NmC); 14,542 suspected cases and 1,166 deaths were reported. Nigeria, a country in the sub-Saharan “meningitis belt,” previously experienced large outbreaks caused by meningococcal A serogroup, which declined dramatically following the introduction in 2013 of meningococcal A vaccines. National and regional evaluations of the outbreak response outlined recommendations for improving meningitis outbreak prevention, timely detection, and response. Implementing these recommendations and expanding the availability of multivalent vaccines effective against non-A serogroups will reduce future meningitis outbreaks. Click on the graphic below to view the PSA. 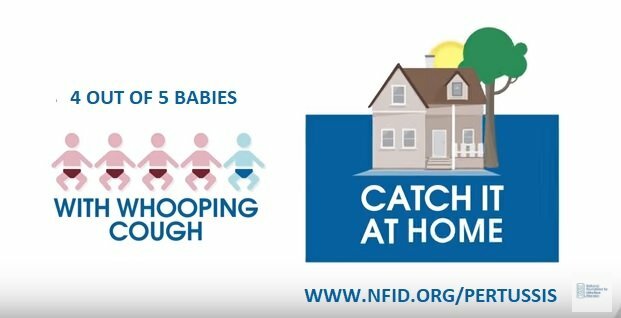 NFID has also published a related guest post on its blog: Protecting Your Children’s Health Through the Holidays. The Hepatitis B Foundation continues its storytelling campaign: #justB: Real People Sharing their Stories of Hepatitis B. Watch the December video, Carolyn's Story, about a young woman in nursing school who found out that her beloved father was dying of hepatitis-B related liver disease, a diagnosis he and her mother had kept secret from their daughters for years. The VICNetwork is a nationwide "virtual immunization community" of health educators, public health communicators and others who promote immunizations to exchange and share resources, materials, and the best practices. On January 10 at 2:00 p.m. ET, the National Influenza Vaccination Disparities Partnership will host a webinar titled "Talking to Patients about Flu: Sharing Facts and Addressing Misconceptions and Hesitancy." The webinar will address current ACIP influenza vaccine recommendations and ways to address flu vaccine misconceptions and hesitancy. The webinar will include opportunities for questions and discussion. The National Influenza Vaccination Disparities Partnership is a national multi-sector campaign, spearheaded by local influential partners and supported by CDC, that commits to promote the importance of flu vaccination among underserved populations. The deadline for submitting an abstract for CDC's 48th National Immunization Conference (NIC) is December 31. The conference will be held May 15–17, 2018, at the Hilton Hotel in Atlanta. NIC brings together more than 1,500 local, state, federal, and private-sector immunization stakeholders and partners to explore science, policy, education, and planning issues related to immunization and vaccine-preventable diseases. Access the guidelines and link for submitting an abstract for the 48th National Immunization Conference. If a woman's rubella test result shows she is "not immune" during a prenatal visit, but she has 2 documented doses of MMR vaccine, does she need a third dose of MMR vaccine postpartum? In 2013, ACIP changed its recommendation for this situation (see www.cdc.gov/mmwr/pdf/rr/rr6204.pdf, pages 18–20). It is recommended that women of childbearing age who have received 1 or 2 doses of rubella-containing vaccine and have rubella serum IgG levels that are not clearly positive should be administered 1 additional dose of MMR vaccine (maximum of 3 doses) and do not need to be retested for serologic evidence of rubella immunity. MMR should not be administered to a pregnant woman. This is the final issue of Question of the Week (QOTW), a special feature of IAC Express since 2014, where CDC experts have provided answers to vaccine questions. We thank all of the CDC experts for making this weekly series possible. “Ask the Experts” is not going away! IAC will continue to provide special editions of IAC Express containing exclusively “Ask the Experts” Q&As from CDC at least five times per year. To access more than a thousand “Ask the Experts” questions that have been answered by CDC, visit IAC’s highly popular “Ask the Experts” web section at www.immunize.org/askexperts. You’ll be able to search IAC’s collection of questions by vaccine or topic to find the answers you’re looking for. If you have a question for CDC immunization experts, you can email them directly at nipinfo@cdc.gov. There is no charge for this service.